A 'mutual fund' allows several investors to pool their resources to purchase stocks, bonds, and other securities. There are several types of mutual funds in the market. Mutual funds are the go-to option for investors worldwide. It has great features like diversification, decent returns, professional management and easy liquidity. Before learning how to get maximum mileage from your mutual funds, let’s get some basics straight. As the name suggests, a 'mutual fund' allows several investors to pool their resources to purchase stocks, bonds, and other securities. Equity funds – This fund invests in stocks of various companies on behalf of investors. These may be large, mid or small-cap funds. These are considered more “risky” as share markets are notoriously difficult to read, even for the best of analysists. However, they do offer better returns on an average. Debt Funds – Investors typically invest in bonds and fixed income securities. These are considered as more “safe” than Equity investments. They may offer a lower rate of return than equity investments as a counterweight to security. Hybrid Funds – These contain a mix of debt and equity funds. These are balanced depending on the risk appetite of the investor. Usually, a 70-30 ratio in favour of equity is preferred. They ensure security as well as capital appreciation. This is considered as the best investment option by a majority of investors. • Invest through SIP’s – An easy way to earn money through mutual funds is through a Systematic Investment Plan (SIP). You set a frequency for your investments in a certain portfolio and money will be automatically invested. All you need to do is to wait and watch it grow.  Rupee cost averaging – With SIP’s you invest a fixed amount every pay period. This means you buy more shares when the price is low and less when the price rises. The cost of buying a unit averages out over a period of time. This prevents missed opportunities and irons out losses.  Compounding – The sooner you start a SIP, and the longer you stay invested helps to accelerate wealth generation. It makes use of compound Interest to boost your profits. • Step up SIP investments – SIPs help you to maintain a regular investment. However, they shouldn’t be kept fixed for the entire duration of the investment. Savings should go up, along with income. Ideally, the investment amount should also be increased with every hike. This allows you to target bigger goals with a bite-sized increment of your investment. It has been shown that even a 10% increase in the invested amount leads to 45% increase in the corpus. • Diversify investments – When investing in mutual funds, it’s crucial to make take full advantage of portfolio diversification. As the old saying goes, never put all your eggs in one basket. Not only can you diversify the type of assets you invest in, but also different fund products to help create a corpus for different needs. Investing in different mutual fund products focussing on varying asset types can be of great help. For instance, balanced funds are great for a mid to long-term scenario, whereas liquid funds do well for short-term cases. Also, investing in different asset classes helps to reduce financial risk. It is unlikely that all major industries would see a downturn at the same time. If your investments are spread across all the major market movers your portfolio would be well hedged and continue to flourish. • Continue SIP investments for the long term – The most important factor in increasing your wealth is to stay invested. As the saying goes “Time in the market” is better than “timing the market”. When people stop investing they miss out on the power of compound interest. 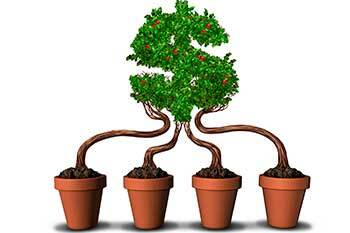 Giving your money time to grow is possibly the best option you have. The more time you invest in the market, the higher return you will get. It’s all simple math. So, invest today and see your money grow!